We’re moving beyond negligible statistical noise here. When you roll standard dice you have a roughly 16% chance of hitting a specific number, one through six. That’s the sort of federal debt fire we’re playing with. 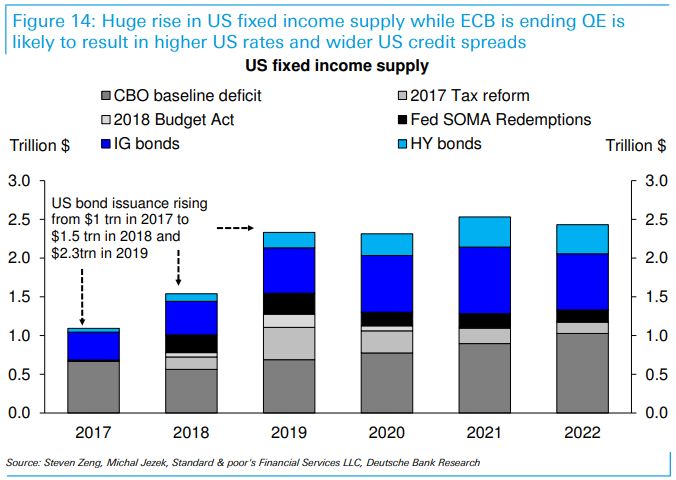 A ballooning budget deficit combined with a rising current-account deficit are raising the odds the U.S. could suffer an emerging-markets-style debt crisis, analysts at Deutsche Bank warned this week. A sovereign debt crisis occurs when a country is perceived as no longer able to meet its debt obligations. Risk is rising and shouldn’t be ignored, wrote Quinn Brody, macro strategist, and Torsten Slok, the bank’s chief economist, in a Wednesday note. Their model calculated that the probability of a U.S. debt crisis has increased by 7 percentage points, from a historical average below 9% to around 16%. They urged investors to keep a close eye on Treasury auctions, they said. After all, trouble digesting rising U.S. debt issuance would be a first sign of trouble.